People call them waders for an obvious reason. When you purchase waders for hunting and fishing, you’re buying a product to get you close to your work. But, in doing so you don’t want to get your regular clothing wet. So, you buy good waders. Simple, right? Not so fast. 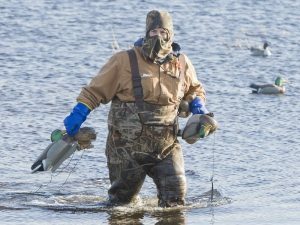 There are different types of waders to consider, depending on how you plan to use them. For example, if you’re going to be stepping into ankle deep water, or water just a few inches deeper than that, you don’t have to spend as much money as you would for waist-high or true chest waders. You will probably have to decide if you want a product with boots as part of the complete unit or if you want something with stocking feet. The term “waders” refers to a waterproof boot that extends to the chest and is usually made of rubber. However, newer products are made with PVC material, neoprene or Gore-Tex. While the term “boot” is used to refer to this special product, they are not the same as hip boots or Wellington-style boots. 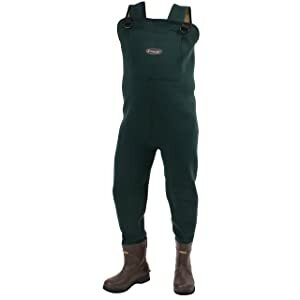 As you look at the information on products from various manufacturers, you’ll be viewing chest waders. Most of the history about this product shows the first commercially produced waders were available in the mid-1800s. It wasn’t until the early 20th century that rubber was used to make this hunting/fishing gear more durable and waterproof. Rubber waders began to improve as this natural material was perfected for other uses during World War II. The two distinct types mentioned earlier were the stocking-foot design and the boot-foot design. As you look for waders to use while hunting, keep in mind these are useful tools for a number of activities in addition to hunting. They’re excellent for some types of fishing, for working with model boats and other water-based activities, and for riding on an all-terrain vehicle (ATV) as a way to protect your clothing. They’re also used in agriculture, industrial settings, and by people who work in the water and/or sewage maintenance field. Check your local and regional guidelines for the types of waders not allowed in streams. Some have felt soles with pores that may introduce organisms posing a threat to fish and small animals. Some states in the U.S. ban these products, as does New Zealand. In the following reviews, you’ll focus on chest waders, though there will also be a quick look at boots and waste-high design as well. To stay warm and comfortable when hunting, you should definitely plan to invest a bit of extra money in high-quality waders. Duck hunting, for example, can be wet, windy and muddy (and those are the good conditions). In fact, the veteran hunter will be a bit more excited when the conditions are great for ducks but not the most comfortable for the hunter. Consider three materials when looking for good waders – nylon, neoprene and rubber. Nylon waders will be lightweight and will be a bit easier to put on and take off. Many trout fishermen wear nylon waders, primarily because they aren’t as uncomfortable during warm weather. However, when you’re duck hunting or heading out to colder, wet conditions, leave nylon at home. Neoprene is the warmest choice for duck-hunting, because they’re comfortable and durable. Check the thickness because you’ll probably see 3-mil and 5-mil designs. If you’re in warmer climates, 3-mil should be fine. Go to 5-mil for colder conditions. You should also look for Thinsulate rating on the boot-foot wader, with 800 and above being the best for cold weather. You can probably wear lighter weight socks with the best insulated boot-foot products. 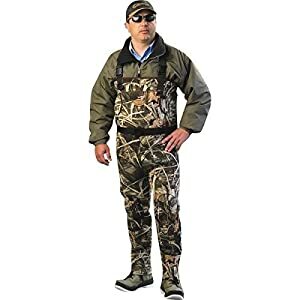 Rubber waders are the traditional/classic among hunters. They are durable and not as expensive as some of the newer items. You will probably sweat a bit more in rubber than with other materials, which can be a negative thing when you’re out during cold weather. Rubber tends to get stiffer when it’s cold as well. If you do choose a rubber wader with boot-foot, be sure they have Thinsulate for warmth. Some don’t. You’ll also have to decide on chest-high waders or hip waders. If you’re only going to have one pair, you’ll be better equipped with chest waders, because they’ll work well in more situations and keep you a bit warmer. Hip waders can be a bit lighter but it all depends on what your usual hunting conditions are. When you buy the LaCrosse Swamp Tuff chest wader you’re getting one of the best products in this line of hunting/fishing tools. No less a source than Field & Stream gave these their Best of the Best Award. The seam-sealing process drew raves from the professionals, providing outstanding protection from moisture. The Swamp Tuff also has a shotgun-shell pouch (removable). It will hold a full box of shells. They’re considered 100-percent waterproof and offer great insulation with a lot of Thinsulate (1000 grams). Boot-foot design, decoy bag on back. You can depend on them in a cold swamp, as the name implies. There’s a little more to the name of these waders, so it’s best to get that out of the way first. The Allen Company gets to the head of the class with the Shadowgrass chest wader and the Mossy Oak chest wader. 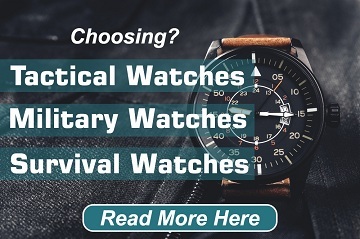 In addition to these two similar products from an industry leader, you can get a new pair free of charge for up to one year of the product fails due to a manufacturing issue. Of course, this doesn’t cover normal breakdown from use over time, or from improper care or abuse. The Shadowgrass design is one of the best you can purchase anywhere. It has a 47-inch chest, with 34.5-inch inseam, fully adjustable suspenders, D-ring front and hand-warmer pockets. You also get a higher back with this design and reinforced pads for protection and comfort. Both the Allen waders are boot-foot. The Jersey Mossy Oak also has high-back design, reinforced knee pads and a nylon knit jersey laminated with neoprene. Rubber boots use Thinsulate and offer steel arch support. As the name implies, these have attached boots, which eliminates the need to purchase additional footwear. These waders stand apart from the crowd not only because of the neoprene lining and the Thinsulate lining to keep you warm and dry, but for the general attention to detail. Cleated outsoles give you excellent traction in the open country. As with many high-quality products, the Toggs waders have hand-warmer fleece pocket and reinforced knee pads. This reasonably priced product is different in one obvious way. It has stocking-foot design rather than boot-foot. It’s flexible and has a durable outer shell of nylon. Reinforced knees for getting down to handling game. They are of excellent quality but may not be suitable for the “full-framed” hunter. With a good pair of boots, these can be an excellent choice. Light weight is certainly a plus. 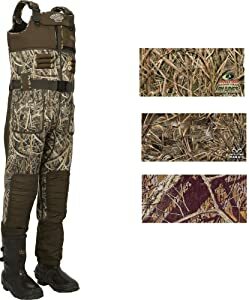 This top-shelf, boot-foot wader has the highest Thinsulate rating at 1,200 grams in the boots, while the waders have 300-gram, polyester insulated/quilted lining. They also have hydro-flex reinforced kneepads. Listed as “breathable” and “insulated” they’re designed to keep you comfortable in a range of temperature conditions. Made with a no-buckle shoulder strap, large cargo pouch, a key/license pocket with waterproof zipper and a Magnattach™ call pocket. Shells are stored in horizontal shell loops. 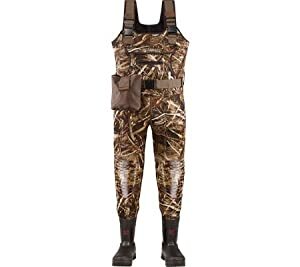 There are basically two types of chest waders – stocking foot and boot foot. Of course, the boot-foot design is more convenient because you don’t have to purchase additional waterproof/insulated footwear. Stock-foot waders might be best if you want to walk to a site and change to your waterproof boots later. For hunting, you should choose one of these two and pay attention to the Thinsulate rating. Using nylon waders for anything but fishing in warmer weather is not recommended. Keeping yourself dry and warm when hunting should be the highest priority. If you have hip waders, make sure they’ll be high enough to handle all water conditions. As with any tools you choose for hunting or fishing, you’ll always be ahead by investing a bit more than you originally planned. Enjoying a sport like duck hunting is only possible if you are comfortable – dry and warm – and able to concentrate on the business at hand. Bottom line – look at the Thinsulate rating, whether you are getting boot-foot or stocking-foot design, and whether you have hand-warming pockets. Good hunting! We are one manufacturer of outdoor clothing ( waterproof breathable waders/ fly fishing waders /Wading shoes,hunting jackets,bib pants,hunting waders,hunting boots/ .etc. First, lowest price in china. Second,We are custom the designs from customers . Hope we could get your interesting, and start our cooperation.